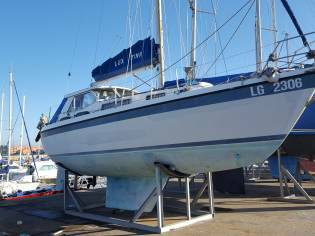 The LM32 is a well respected, high quality, Danish built motorsailer with excellent seagoing capability and spacious accommodation and facilities. 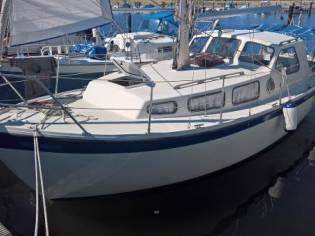 This boat has been well maintained by the current and previous owners and is being sold reluctantly due to change of personal circumstances. Well worth a look and early viewing is recommended. LOA 9.75m. LWL 8.49m. Beam 3.25m. Draft 1.5m. Displacement 6001kg. Ballast 2194kg. The body and superstructure are in off-white GRP and the deck is in pale grey GRP. Easily navigated side decks, secured by stainless steel pulpit, alloystanchions and double guard wires. Fin keel with encapsulated ballast and a semi balanced rudder. 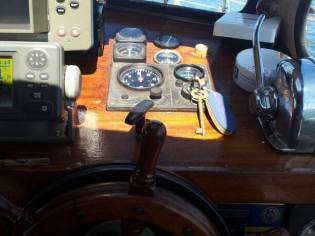 Wheel and tiller direction in the captainhouse and aft deck/cockpit. 5 docks in total comprising of "V" dock in fore compartment and two settee docks in bar (fitted with lee cloths) one of which converts to a double. The inside is finished in varnished teak and blue cushioning. Eberspacher Airtronic D5 heating unit. Vents in all compartments. 12v and LED lighting throughout. 1.85m headroom. Ample safe and storage seating throughout. FCC Precision clock & barometer. Forward compartment with a double dock in "V". 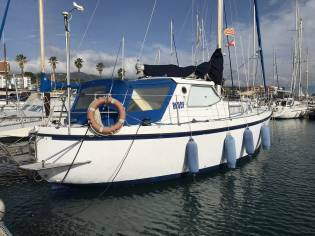 The Saloon is bright and roomy and special single settee dock to seaport and settee dock to stbd which converts to a double dock and a folding leaf desk. Linear Galley to seaport in the deckhouse. Sink with pressurised chilly water unit + hand-operated stern up. Flavell B 70 C - 2 burner gasoline cooker with oven and grill. Electrolux RM4271 mini domestic type refigerator which can be run on 12v , 220v or gasoline. In addition there is an ingenious folding cockpit desk which together with the full cockpit enclosure and cockpit padding is perfect for alfresco dining . Spacious quantity compartment. Slide out hand tank and pressurised chilly water unit with shower attachment. Jabsco marina flushing toilet. Single front roller. Lofrans Cayman ***.***. ***w electric mainstay windlass with warping drum, remote and foot controls. 35lb CQR mainstay with 55m of 10mm chain. 35lb Danforth mainstay. 9 warps. 9 fenders. 6 mooring cleats. 2.3m Waveco dinghy - 2017. Stern boarding ladder. Winches. 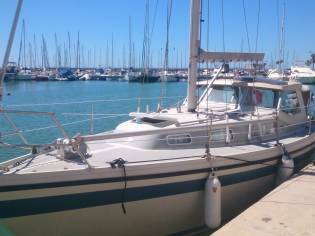 2 x Meissner 18 two velocity halyard winches. 2 x Gibb 40 STA single velocity self tailing primary winches. 2 winch handles. ICOM IC-M411 DSC VHF radio in captain house. Garmin GPSMAP 182c captain house & cockpit. NAVICO DS200 echosounder in captain house. Autohelm 2000 autocaptain in captain house. Silva 100 compass in captain house. Sumlog SL velocity/log in captain house. Tactick mn100-2 wind velocity/direction. 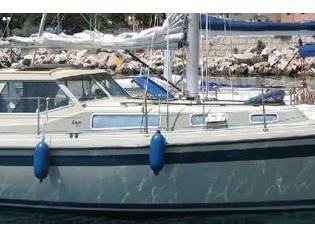 Powered by a Bukh DV36 SME 36hp inboard 3 cylinder marina diesel engine with sail navigate to a 3 blade fixed prop. Last assistance Apr 19. Engine hours 3,333. Sea water cooled. Fuel consumption 2.5ltr/hr. Range 400nm approx. Single lever morse control. Vetus 55 kgf front thruster. Fuel 200ltr. Water 200ltr GRP. Black holding tank 65ltr GRP. 12v ships electrical unit. 2 x Power Plus 12v 110ah domestic batteries - 2017. 1 Numax 12v 100ah engine start charger - 2017. 230v sand potential with well pre-owned cable. Sterling Intelligent Pro Charge charger charger. Engine alternator also charges batteries. Solar charge controller. Separate engine & domestic circuits. Silver Crest Stereo with inside and outside speakers. Cockipt cover in good quality. Cockpit tent in fair quality. The safety machinery listed below may not be assistanced up to date at the point of sale and is sold “as is”. Electric bilge pump. Manual bilge pump. Fire blanket. 2 fire extinguishers - Fire Chief in cockpit and ANAF in bar. 2 Jackstays. 2 harness points in cockpit. Lalizas life link. Lifebuoy. Navigation illumination. Built by LM Glasfiber A/S in 1979 and crafted by Bent Juul Andersen. 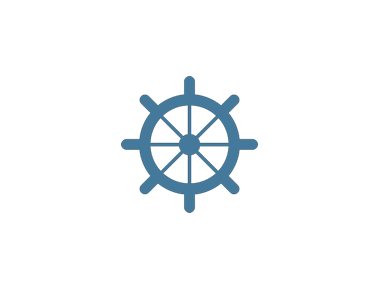 LM 32 is the make and model of this motorsailer of 9,75m of length and 3.25m of beam. 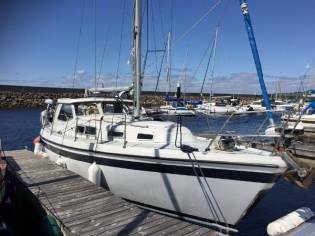 The sale price is 34.688€ and you can see it in Aberdeenshire (United Kingdom).